Stock removal refers to the process of grinding a knife out of a piece of steel. 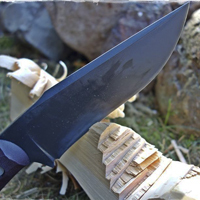 At Guinea Hog Forge our stock removal knives are hand-made, but not hand-forged, and some parts of the construction process are out-sourced. Out sourcing allows us to produce runs of Scott's original designs at a lower price than can be offered on hand-forged blades. 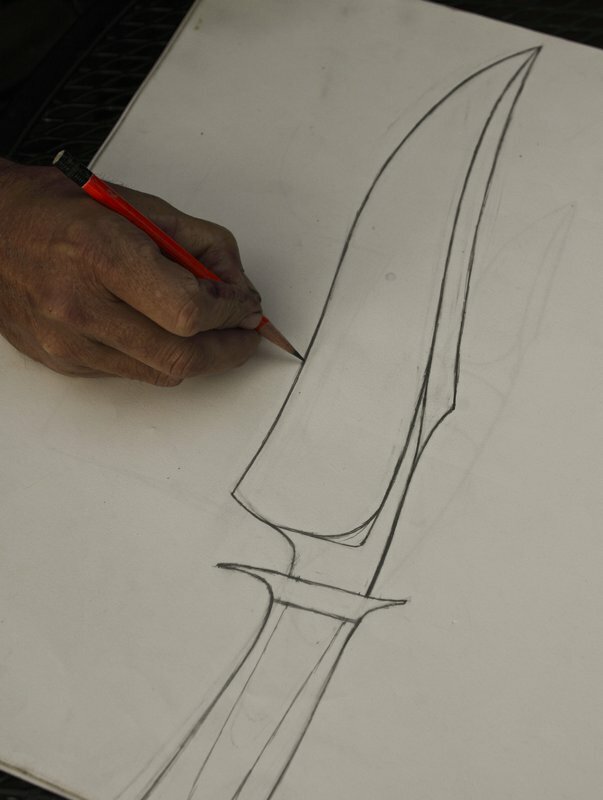 The stock removal process is faster, but no less rigourous, and our stock removal knives are held to the same performance standard as our hand-forged works of art. In addition, the stock removal process also allows us to offer high quality stainless blades that we cannot forge or heat treat ourselves. 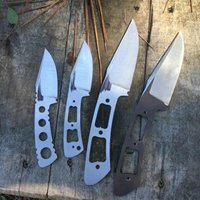 Design: The design process for our stock removal blades is very similar to that of our hand-forged ones, and we often used hand-forged prototypes as the inspiration for stock removal runs. Every design starts on paper, moves to a wooden mock-up and then is prototyped either through hand-forging or grinding. Production Runs of Stock Removal Blades: Once a knife design meets Scott's rigorous standards for functionality and aethetics, we create a digital drawing of the design on a computer (i.e. CAD file), send the CAD file to a professional waterjetter, and have a run of knife blanks cut from a sheet of high quality carbon or stainless steel. Rough Grinding: Waterjet blanks are simply knife shape slabs awaiting transformation. After they arrive via common carrier, Scott spends a lot of time adding bevels (rough grinding) so that a true knife-like form begins to appear. These blanks are still just knife shaped objects, however, as it is the heat-treating process that turns them into hardened, usable tools. 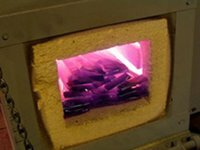 Heat Treat: We send the majority of our rough ground stock removal blanks to a professional heat-treater as they can heat-treat groups of like-knives in a short amount of time to a very specific hardness. They can also heat treat stainless steels, which we cannot heat treat in house. The hardness Scott specifies depends on the steel, as well as the task of the tool. 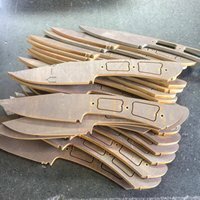 Final Grind: When the knives arrive back from the heat treater, they are officially knives, but do not have handles, and the bevels need to be final ground. Scott final grinds all his knives on our Wilmont Grinder and then handles them in house. 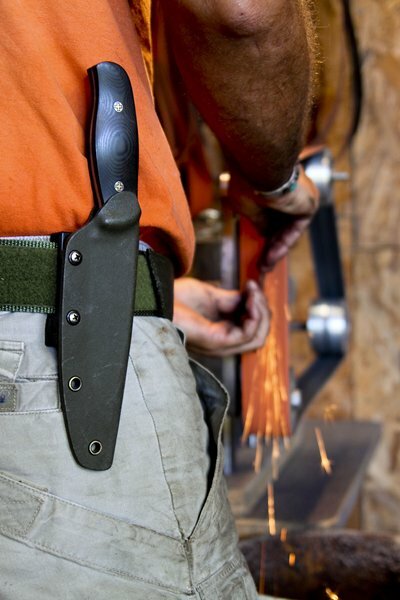 Helving: Scott handles our stock removal knives with both man-made and natural materials. As a former arborist, he loves the aesthetic of wood, but most of our stock removal knives get Micarta or G-10 handles as phenolics are more stable and tougher, which makes them a better choice for hard-use knives. 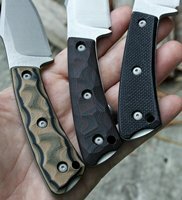 Marks: Stock removal knives made since Scott was certified as an ABS mastersmith (June 2016), have McGhee Knives with a big "V" etched on the blade. Stock removal knives produced before Scott obtained his MS mostly have the Chinese symbol for water after E. Scott McGhee-Guinea Hog Forge (because they were produced via a waterjet process). Stock removal kitchen knives made before he obtained his MS recieved no extra mark after his name because they were made completely in house. Sheaths: Scott currently makes all the sheaths for our stock removal blades in house out of either Kydex or leather. Testing: We test our stock removal knives just as hard as our hand-forged blades as these tend to get used hard on a regular basis.